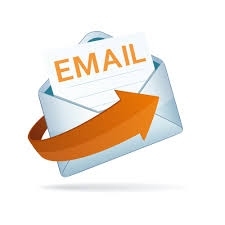 Upcoming Events. . . .
Sign-up here to receive eMail, Newsletters, notices of Events, and other Communications from the Lodge. You do not have to be a Member of Nelms - you just need to be a Master Mason! GEORGIA MASONS DID IT !! We got the required 1000 applications for the State to start production on Masonic Car Tags. The goal of the Nelms Degree Team is to present the ancient Masonic degrees to new Masons via allegory, symbols, and historical lessons. The brethren on the Nelms Degree Team are devoted to helping each new Mason, as well as each other, improve themselves in Freemasonry by putting our best apron forward. Hope you can join us for some of these events! This teacher has been teaching elementary school since she graduated from Berry College in 1979. Her first school was Cloverleaf Elementary in Cartersville, GA. Shortly after earning her Master's Degree from Oglethorpe University in 1982 she joined the staff of Pace Academy as a Pre-First Teacher where she implemented transition from a double-session kindergarten to a more progressive pre-first program. She also designed curriculum and policy as a Lead Pre-First Teacher. She is a two-time recipient of the Kessler Excellence in Teaching Award. She currently oversees the Academic Resource Center in the Lower School of Pace Academy where she has helped 100's of students with learning differences to develop the skills and tools they need to thrive in the classroom. It is my honor and pleasure to introduce the 2017 Nelms Lodge Teacher of the Year, Deb Cook. The Masons of Nelms Lodge #323 of Smyrna provided a bit of hospitality and love to their families and widows on Monday August 28th. Lodge Worshipful Master, Rick Hallwood, said that the event was held to reinforce the Masons’ support of their members’ companions and widows. Although a Brother Mason has passed away, we don’t forget their widows. And, if these widows need anything, we’re obligated to help them. And we always go help them – no matter what. "This may appear to be an individual award, but I do not consider it as such. 2015 was an excellent year for Nelms #323 only because of the eagerness and willingness of officers and brethren to help reestablish ourselves in the community and focus on making good men better. We completed an incredible amount in 12 months, and I'm grateful for the trust you placed in my leadership"
Lodge, Wor. Bro. 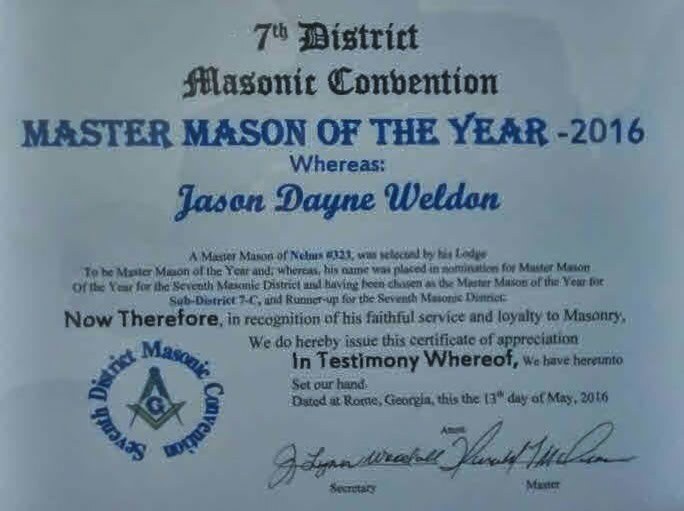 Jason Weldon was named Master Mason of the Year for 7C. In 2015, we adopted a mile surrounding our lodge and have conducted quarterly clean-up events to keep the road free of trash and debris, and have received an award from Keep Smyrna Beautiful for our work. 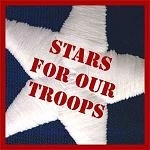 our Military personnel with a letter writing campaign. family can be involved in". The Lodge is providing a convenient collections place for our Annual Flag Retirement Ceremony and for Community Letters to our Troups! Questions? Please call Jason Weldon at 678-449-7528. Bro James Smith says baby Josephine is fully recovered. Thank you Lord! Brothers, please pray for God's healing powers to help Josephine and keep James and his family in your prayers. Wor Bro Jason Weldon's Father-In-Law, Dennis Osmer passed this morning. Please keep Jason and his family in your prayers. Dennis C. Osmer, age 70, of Suwanee, GA passed away on Friday, December 1, 2017. He is survived by his wife of forty-four years, Donna Osmer, Suwanee, GA; children, Eric and Yao Zheng Osmer, Naperville, IL, Karen and Jason Weldon, Smyrna, GA; grandchildren, Christian Weldon, and Leah Weldon; brother and sister-in-law, Paul and Anne Osmer, Leland, NC; several nieces and nephews. Mr. Osmer was born June 25, 1947 in Paterson, NJ. He was a 1965 graduate of Paramus High School, Paramus, NJ, a graduate of Fairleigh Dickinson College with a Bachelor’s Degree, and he also received his Master’s Degree. Mr. Osmer was retired from the Novartis Company with 40 years of service. He was a member of McKendree United Methodist Church in Lawrenceville, GA. In lieu of flowers, memorial donations may be made to: McKendree United Methodist Church, 1570 Lawrenceville Suwanne Road, Lawrenceville, GA 30043 in memory of Dennis Osmer. Wor Bro Jason Weldon's Father-In-Law, Denis Osmer is still struggling. He and the family need our continued prayers. Welcomes you to find out more about how You can show support to those that have Served and those that are serving - our Military, our Veterans and our First Responders. can now Pay your dues or make a donation to the Lodge right here on our website. There is only a small processing fee for the convenience of dues-payment; and no fee at all for any donations. Thanks!! A note about the donation selection for the Grand Lodge Per Capita tax - this amount is included in your annual dues. However, if you are an Emeritus or Life member, you deservedly do not pay dues any more. This is just a way that you can help the lodge by volunteering to cover the Grand Lodge fixed costs. We can't thank you enough Anita! Please take notice of the Nelms Lodge grounds! Through an exceedingly gracious gift, Anita Gaines (daughter of the late W. Bro. George Gaines) has funded the landscaping of Nelms Lodge as a way to thank the lodge and fraternity that meant so much to her father for 60+ years of his life. In 2015 Ms. Gaines hired a landscaper to mow, trim, and blow once or twice per month. In itself, this was a tremendous help to our lodge, but Ms. Gaines did not stop there. She also had a retaining wall built between our parking lot and CVS, and new flower beds installed in several areas. 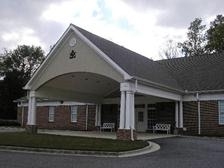 We were able to install a gate in 2015 to help protect our property, and jonquil flower beds on either side of the front door (along the front side of the building). Thanks to her generosity, our lodge now looks better than ever. A plaque was installed on the new wall in dedication to W. Bro. Gaines via his daughter, Ms. Anita Gaines. Thank you Ms. Gaines! Please eMail Jim Cook to Volunteer! Please eMail Greg Brennan to Volunteer! Jim Cook and Rick Hallwood signed up 12 Kids! Jim Cook & a small team signed up 9 Children! A benefit organization for Master Masons. It's purpose is to render financial aid and assistance to a member Brother's beneficiary(s) upon his death.